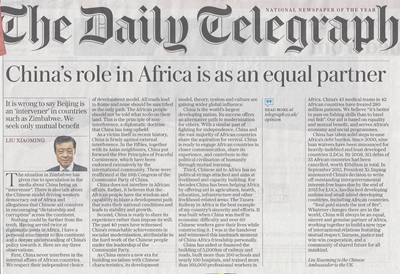 The Daily Telegraph Publishes a Signed Article by Ambassador Liu Xiaoming Entitled " China's role in Africa is as an equal partner"
The situation in Zimbabwe has given rise to speculation in the media about China being an “intervener”. 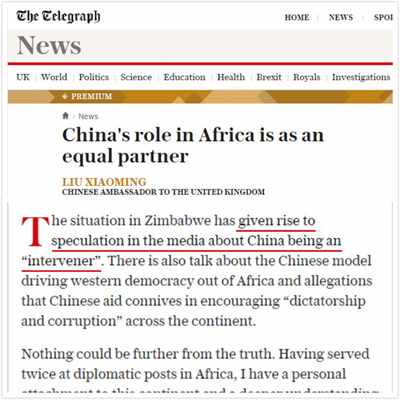 There is also talk about the Chinese model driving western democracy out of Africa and allegations that Chinese aid connives in encouraging “dictatorship and corruption” across the continent. Nothing could be further from the truth. Having served twice at diplomatic posts in Africa, I have a personal attachment to this continent and a deeper understanding of China’s policy towards it. Here are my three observations. First, China never interferes in the internal affairs of African countries. We respect their independent choice of development model. All roads lead to Rome and none should be sanctified as the only path. The African people should not be told what to do on their land. This is the principle of non-interference, a diplomatic doctrine that China has long upheld. As a victim itself in recent history, China is firmly against external interference. In the Fifties, together with its Asian neighbours, China put forward the Five Principles of Peaceful Coexistence, which have been endorsed extensively by the international community. These were reaffirmed at the 19th Congress of the Communist Party of China. China does not interfere in African affairs. Rather, it believes that the African people have the wisdom and capability to blaze a development path that suits their national conditions and leads to stability and growth. Second, China is ready to share its experience rather than impose its will. The past 40 years have witnessed China’s remarkable achievements in socialist modernisation, attributable to the hard work of the Chinese people under the leadership of the Communist Party. As China enters a new era for building socialism with Chinese characteristics, its development model, theory, system and culture are gaining wider global influence. China is the world’s largest developing nation. Its success offers an alternative path to modernisation for others. With a similar past of fighting for independence, China and the vast majority of African countries share the aspiration for revival. China is ready to engage African countries in closer communication, share its experience, and contribute to the political civilisation of humanity through mutual learning. Third, Chinese aid to Africa has no political strings attached and aims at livelihood and capacity building. For decades China has been helping Africa by offering aid in agriculture, health, education, infrastructure and other livelihood-related areas. The Tazara Railway in Africa is the best example of my country’s sincerity and efforts. It was built when China was itself in economic difficulty and over 60 Chinese workers gave their lives while constructing it. I was at the handover and witnessed this landmark moment of China-Africa friendship personally. China has aided or financed the building of over 5,000km of railway and roads, built more than 200 schools and nearly 100 hospitals, and trained more than 160,000 professional workers in Africa. China’s 43 medical teams in 42 African countries have treated 280 million patients. We believe “it’s better to pass on fishing skills than to hand out fish.” Our aid is based on equality and mutual benefit, and serves Africa’s economy and social programmes. China has taken solid steps to ease Africa’s debt burden. Since 2000, nine loan waivers have been announced for heavily-indebted and least developed countries (LDCs). By 2009, 312 debts of 35 African countries have been cancelled, worth $3 billion in total. In September 2015, President Xi Jinping announced China’s decision to write off outstanding intergovernmental interest-free loans due by the end of 2015 for LDCs, landlocked developing nations and small island developing countries, including African countries. “Real gold stands the test of fire”. Whatever changes there are in the world, China will always be an equal, sincere and genuine partner of Africa, working together to build a new type of international relations featuring mutual respect, fairness, justice and win-win cooperation, and a community of shared future for all mankind.